BOSTON, April 2, 2019 /PRNewswire/ -- DPS Group, a privately-owned, global consulting, engineering, procurement, construction management and validation firm serving high-tech process industries, and design affiliate TRIA, a partner-led architecture firm with a focus on science and technology organizations bringing new discoveries to the market, are proud to announce that their design of a new clinical development manufacturing facility for Moderna has won the ISPE 2019 Facility of the Year Award (FOYA) in the Facility of the Future category. ISPE's Facility of the Year Awards is the premier global awards program recognizing innovation and creativity in the pharmaceutical and biotechnology manufacturing industries. Announced today at the 2019 ISPE Europe Annual Conference in Dublin, Ireland, the award-winning projects set the standard for pharmaceutical facilities of the future by demonstrating excellence in facility design, construction, and operations. DPS and TRIA provided full architectural, engineering design, and project management services for Moderna's new 200,000 SF Current Good Manufacturing Practices (cGMP) mRNA clinical manufacturing facility in Norwood, Mass. Moderna is a clinical-stage biotechnology company pioneering messenger RNA (mRNA) therapeutics and vaccines to create a new generation of transformative medicines for patients. 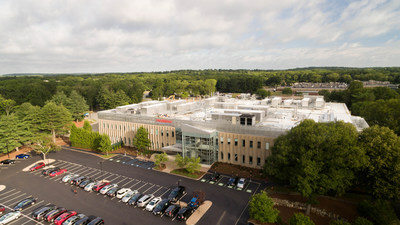 The company's Norwood facility provides the capacity to develop materials for pre-clinical studies, as well as Phase 1 and Phase 2 clinical development programs. ISPE selected Moderna as the 2019 Facility of the Future Category Award winner for the potential impact on patients through accelerated delivery of a new category of medicines. "We are delighted to have worked with Moderna to bring this new state-of-the-art facility to successful completion," said Frank Keogh, chief executive officer, DPS Group. "It is extremely gratifying to deliver on Moderna's vision for a digitally-enabled, flexible and scalable facility to develop innovative medicines for patients. DPS and TRIA warmly congratulate Moderna on winning this prestigious ISPE Facility of the Future Category Award." DPS Group is a global consulting, engineering, and construction management company, serving high-tech industries around the world. Visit: www.dpsgroupglobal.com. TRIA combines a deep understanding of the unique needs of science-based organizations with experience constructing spaces and places that enable those organizations to meet their goals. Visit: https://tria.design.